The single pocket can be used to display all the information such as the event details, maps, directions, rsvp cards, reception cards, hotel & registry information, etc... The maximum width that can be placed inside the pocket is 6". If you are including an envelope inside the pocket, we would recommend using a A1 Square Flap or A1 Euro Flap size envelope. Due to the style of the card, it is NOT compatible with most home printers. It is best to print on an insert and place inside the pocket. If you need printing directly on the card, please contact a local print shop. You can order any of our papers and use our Custom Cutting service to have the paper trimmed to the size you need. You may also order paper uncut and have it cut locally. You can use our Adhesives or any adhesives intended for photo mounting to adhere the Base on the middle flap. Answer: This will fit inside the A7 Envelopes (5 ¼” x 7 ¼”) perfectly. The Pocket Card is 5" x 7" when folded. 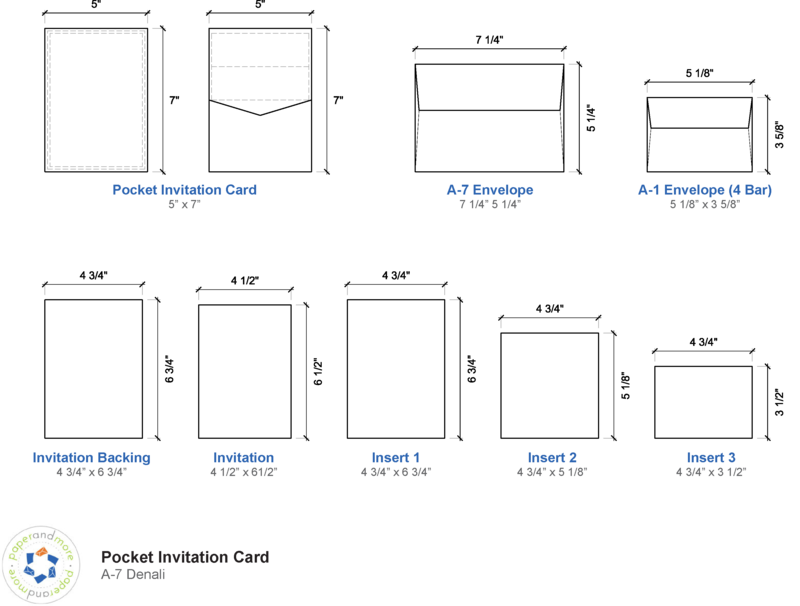 We carry an A7.5 pocket (5 ¼” x 7 ¼”) which fits a 5” x 7” inch invitation in the Center Flap. The design of the Himalaya is different than the Denali pocket. These items are often purchased together with this item: Peach (Coral) Metallic Pocket Invitation Card, A7 Denali. Click the right arrow (swipe on mobile) to view more items.